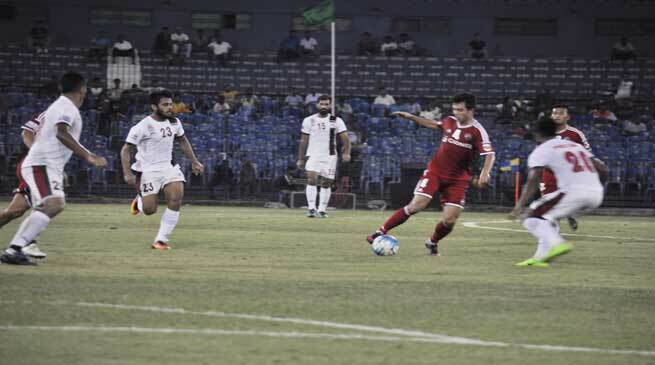 Mohun Bagan beat Shillong Lajong by 3-2 at the Barabati Stadium in Cuttack on Wednesday evening. Shillong Lajong took an early lead after Mohun Bagan defender Pritam Kotal scored an own goal in the 3rd minute. But the defending champions didn’t take much time to equalise as Daryl Duffy made a run on the left to beat Vishal Kaith in the 5th minute. In the 27th minute of the game, the referee awarded the Kolkata side a free kick just outside the box and Sony Norde made no mistake to send a powerful shot that found the back of the net. The Reds came very close to level the score when Rupert Nongrum fed a good cross to Redeem Tlang inside the box but the latter’s header went narrowly wide in the 30th minute. In the 35th minute of the entertaining clash, Shillong Lajong was given a free kick after a foul was committed on Redeem Tlang. Isaac, the free kick specialist, delivered a powerful shot from the left which was met by Fabio but Debjit Majumdar rose high to collect it easily and denied Lajong their second goal. Thangboi Singto’s side were working hard up front but as luck would have it, it was Bagan again who converted their chance to make it 3-1. Yusa Katsumi pounced on a shot by Sony Norde to tap in the ball inside the net in the 43rd minute. After the break, Shillong Lajong was given a free kick after the referee spotted the foul, Isaac stepped up but his shot was cleared by the Mohun Bagan defence in the 48th minute. Shillong Lajong came very close again to score their second in the 57th minute when Alen Deory passed the ball to Redeem Tlang who then made a quick run inside the box but was blocked and Debjit saved the ball from entering the back of the net. Shillong Lajong saw many chances coming their way in the second session of the game and was finally paid off with their efforts when Yuta Kinowaki slotted the ball home from an Alen Deory assist in the 80th minute to make it 3-2 for the Reds. Mohun Bagan had a couple of great chances to extend their lead but were not clinical in their finish. Lajong fought hard towards the end but they were unlucky not to get a point at the end of the match. Shillong Lajong will play their next game against DSK Shivajians on Friday at 4PM in Cuttack.